Boy oh boy, do I have dinner for you tonight. Hush! No questions yet!! First, you must drink wine. It’s Friday, after all. That’s better. Now, sit back and relax while I entice you with this cheesy zucchini masterpiece. First things first: get yo’ dough. I really like the recipe I have for pizza dough, but since I was at work all day I decided to just pick up some whole wheat dough from Trader Joe’s. This stuff is great and only, like, $1.99! 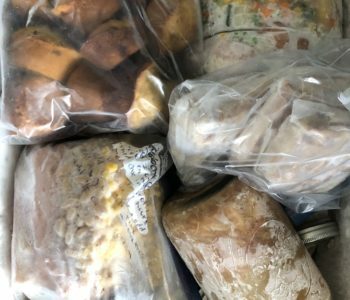 If follow my lead and cheat like me, it’s important to take the dough out of the fridge about twenty minutes before you plan to use it so it has some time to warm up. Zucchini! They’re everywhere! My favorite way to eat zucchini will always be in a sweet bread form, but this pizza is definitely a close second. And, let it be noted that for this recipe I actually only ended up using two of the three zucchini you see here. 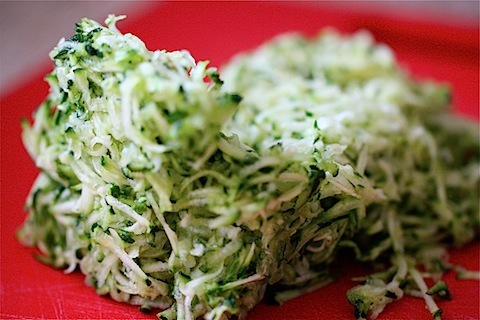 So first things first, wash the zucchini and then GRATE them! 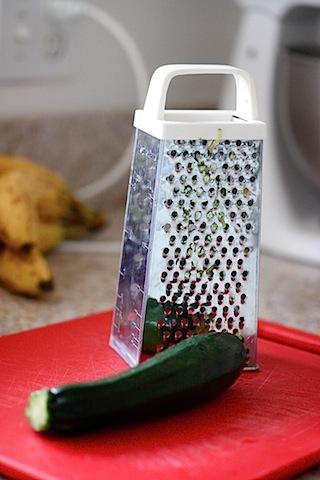 Yep, you heard me—grate ’em! I heard about the grating zucchini idea from an article on Babble a few days ago. How interesting! 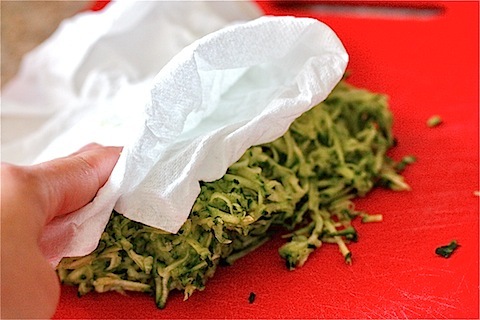 Once you’re through grating, press down with a paper towel to soak up some of the zucchini-water (zucchini-water?). I also like to just take the zucchini in my hands and squeeze over the sink to get out all the zucchini-water that I can. Plus, who doesn’t like to see bright green liquid dripping from their fingers? 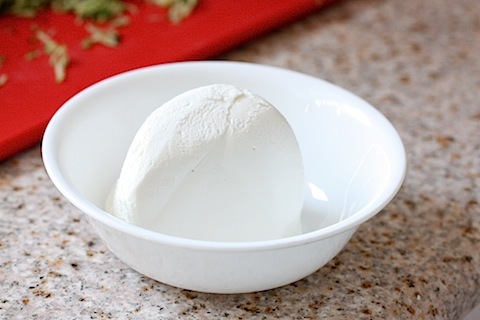 Put one cup of ricotta cheese in a bowl. 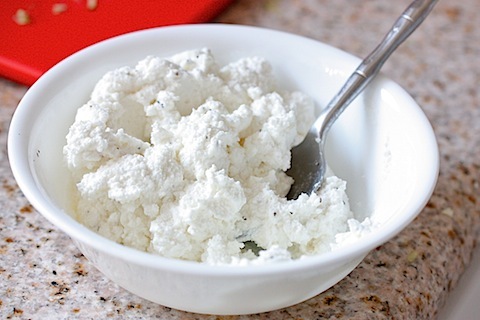 I don’t buy part-skim ricotta because I don’t like the way it tastes. But you could if you really wanted to….it doesn’t make much difference. When it comes to cheeses, I say go big or go home! Now, add two minced garlic cloves and a pinch of sea salt and pepper to the cheese and stir well to combine. Set that aside. 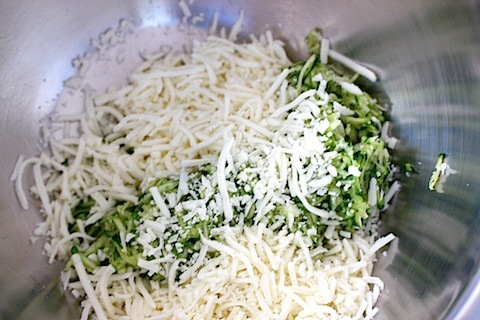 In another bowl, combine the zucchini plus two cups of shredded mozzarella cheese. Stir and then add a pinch of sea salt and pepper to that as well. Set all that business aside now and start to work on the dough. I lack talent in the pizza dough throwing competition, so my crusts always end up looking a bit rustic, if you will. Ain’t no thang! Tonight I felt like forming a rectangle, so I did. Remember to either dust cornmeal or spray your baking sheet with cooking spray so there won’t be any stick action happening. That’s the LAST thing you want! 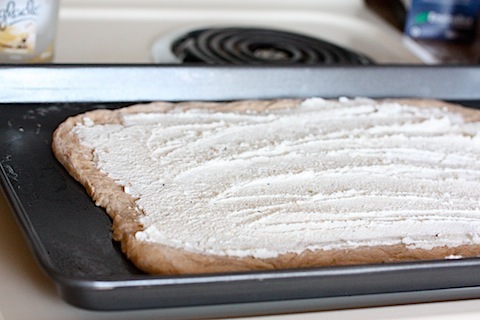 Spread the ricotta cheese gently on the dough. Top with the zucchini mixture. Then bake that sucker! I baked this guy at 450 for about twelve minutes. I never use a timer because in culinary school we didn’t have them. It sucked at the time but forced me to always be aware of what was in the oven and learn to bake things based on “feel” and not on time. If you ever ask a chef how long something takes to cook they will simply tell you “cook it until it’s done”. And that’s that. Ain’t it purdy? I love the bright green color. This would also be great cut into tiny squares and served as appetizers for a dinner party. I never have dinner parties though (anyone want to come over for dinner? please? friends?) so I cut this into HUGE squares and proceeded to stuff my face. I’m in my happy place right now and it feel so gooooooooooooooooooood. 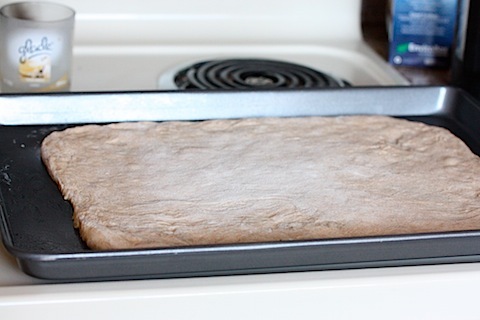 pizza dough: either regular or whole wheat. Preheat the oven to 500 degrees. Either dust cornmeal on a baking sheet (or pizza stone–even better!) or spray with nonstick spray. Set aside. Grate the zucchinis and press with paper towels to soak up the liquid. 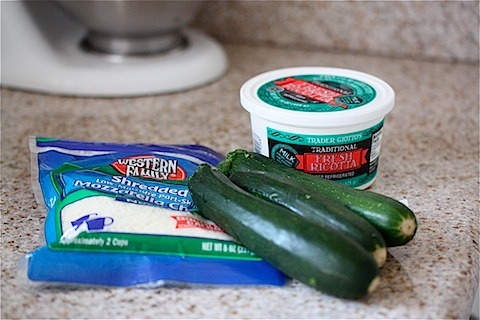 Mix the zucchini with the mozzarella cheese and a dash of salt and pepper. Stir well to combine. 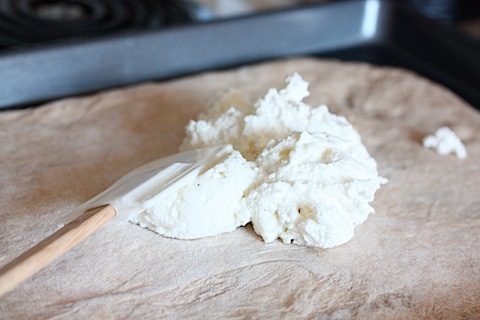 In a small bowl, combine the ricotta cheese and garlic. Season with sea salt and pepper to taste. Work the pizza dough into whatever shape your heart desires. Spread the ricotta cheese on top and then top with the zucchini mixture. 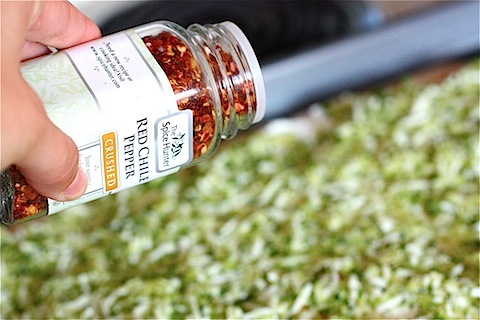 Add some pepper flakes if you like spice in your life. Reduce oven temperature to 450 and bake pizza for about 12 minutes, or until the crust begins to turn golden and the cheese has started to bubble. Cool, slice and stuff your face. I LOVE TJ’s WW pizza dough!! I always think about making my own and then figure I can get one at TJ’s for 99 cents. PS I want your lens…still! Keep it up Jenna, I don’t need to button my pants anymore anyway. elastic waist, elastic waist, elastic waist! I can hear their chanting!!!! Thank you for sharing this recipe! We have an abundance of zucchini in a garden I’m sharing with a friend. 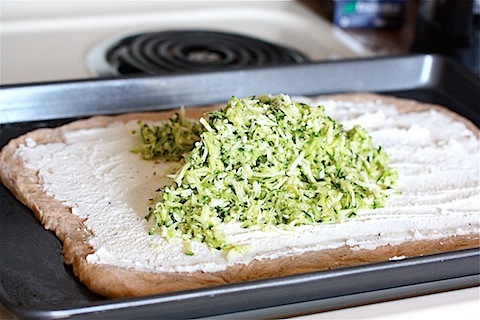 A friend shared a yummy, yummy recipe for pineapple zucchini bread but I can’t wait to make this pizza. Like you, a bought a hearty basil plant at the store a couple of weeks ago. I’m going to add a bit to one side of the pizza. And maybe tomato? Or should I keep it virgin zucchini? I added basil to the ricotta and it was so good! I commented about the pizza on the last post – it wouldn’t go through on this on. 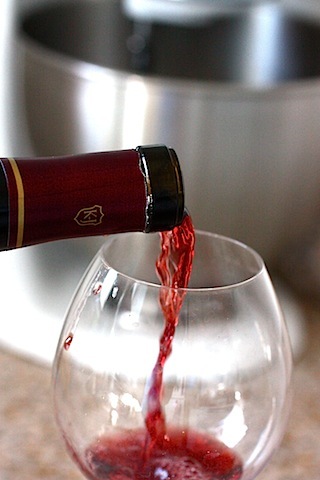 But just know that pizza and wine and seeing you write about it the way YOU do…makes me happy. Very, very happy. And not so alone in the world. Hey, it’s a pizza dinner tonight in our household too! Yay for homemade pizza! I love pizza – and you have made this pizza look so beautiful! The photographs are fantastic, and I cannot wait to try. Jenna, my mouth just watered reading that post. Wow. Looks delicious, but I haven’t seen a zucchini all summer! I have millions of tomatoes though. If you need to get rid of those, check out my tomato dressing! I was wondering what to do with those 3 zucchinis in my refrigerator…now I know! I’m making this for tomorrow’s dinner. It looks fantastic! My GOD this looks amazing. Thank you for bringing this recipe into my life! i’ve been looking for a new zucchini recipe. last year i got so sick of zucc bread so i need new ones so i don’t burn out. thanks! I alwayssss get dough from TJ’s it rocksss! Wowie wow oh wow. #1- this looks AWESOME. #2- these pics are stunning. What settings are you using?? The new lens was a great investment!!! thanks! I LOVE the lens. I messed around a bunch with those photos, shooting in manual mode with a very low aperture (2.0) and a shutter speed of 1/320. My kitchen is the size of a linen closet but does have good light at least! This looks insanely delicious! I can’t wait to try the recipe! No blood on the shredder… good sign. My mouth is literally watering as I read! I am SO making this in the near future! YUM!! That does look amazing! I LOVE pizza! Especially when it has ricotta on it. 😀 Thank you so much for this recipe. How wonderfully easy! I think it’d make a great appetizer, too. I have had some of that TJs pizza dough in my fridge for like, 2 weeks and haven’t gotten around to making anything, so thanks for the recipe! This looks really good and I don’t even like cheese (gasp, I know!). My fiancé makes this grilled bruchetta with ricotta, pesto, and sun-dried tomatoes. And I like that, and I LOVE zucchini (fried is my favorite form) so I totally think this would work for me. And it has cheese so it’d work for the boy. Perfection. Mmmm! Just looking at that makes me start planning a dinner party around it. Talk about utilizing the summer goods. 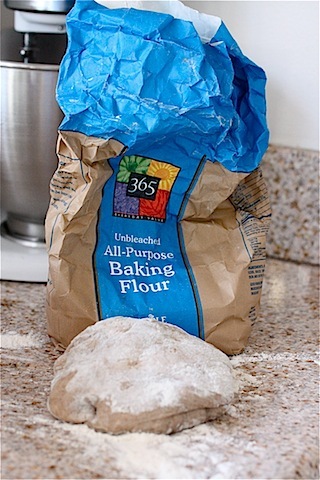 I was already planning on picking up WW pizza dough from TJs this weekend…now I know what to cook with it! The step-by-step photos are so helpful – thanks! 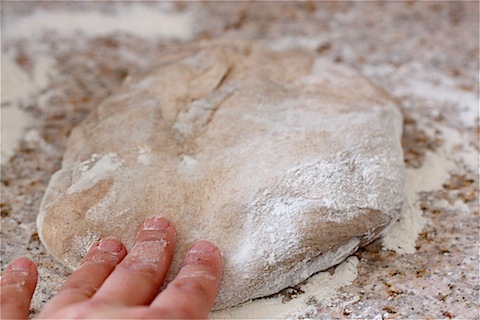 Just a note on your recipe – pizza stones do not need to be sprayed with nonstick spray and should be put in the cold oven before turning it on to heat the stone up with the oven. If you use a pizza stone, you would dust a rimless baking sheet or pizza peel with cornmeal or flour and slide the uncooked pizza from the sheet or peel to the hot pizza stone. O.M.Gosh. Lady, you never cease to amaze me! I’m so luck that I have a gigundo garden fresh zucchini sitting on my counter just begging to be made into a pizza masterpiece! Thanks!!!!! I’m starting to wish there was a Trader Joe’s where I live! I love to jog and yoga, and lead a healthy lifestyle so I was super excited to find your blog. For a while now I have been on a pescatarian, minimal dairy diet due to digestive disorders the Drs couldn’t figure out until recently (after 4 years) that hopefully, after yesterday’s surgery, will be gone! I am hoping I can make and eat this pizza in the near future! Until then, I’ll be enjoying your blog during my recovery and after. Can’t wait until I can get my running shoes back on (I’m at a snail’s walking pace right now), and enjoy this and that divine shrimp recipe from the other day. So thanks for sharing a time and temperature and it looks really interesting! I know what I’m making the next time my fiance is gone! This looks absolutely delicious. I can’t imagine working without a timer. It’s a skill I’ve never developed. I like having a reminder of when time’s up because I am horrible at keeping mental track of it (I have no sense of time). This looks soooooo amazing. I shall be making this soon. It looks easy and satisfying – can’t go wrong with that!! I love using the TJ dough too. Thanks!!! 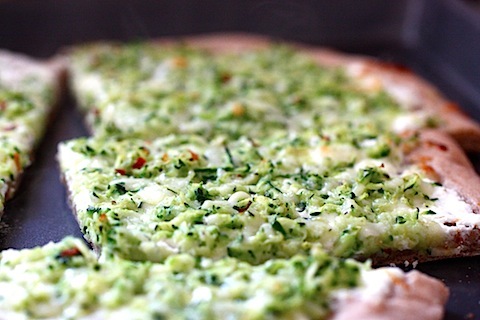 I normally eat veggie pizzas when the family isn’t around but I’ve never tried grating the zucchini….what a great idea! 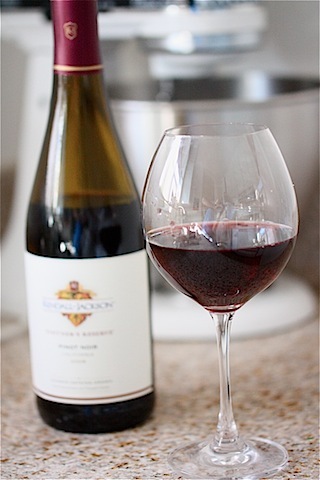 T.J.’s dough is all I ever use…..to lazy to make my own for some reason:) Cheers! I want to come over for dinner! That pizza looks a-ma-zing! I love zucchini and I love Kendall Jackson too. Yummm. I know what i’m making for dinner tomorrow! Scratch that…I know what I’m making for breakfast tomorrow! I don’t think i’ll be able to wait that long to stuff that in my face! TJ’s pizza dough is the ish! I always buy that for my pizzas. Too easy! How funny you made something with zucchini! I think tomorrow is Sneak Some Zucchini on your Neighbor’s Porch Day. Or something like that. You should throw some of the pizza on a neighbor you like…or don’t like! This is the most tantalizing and amazing recipe you’ve shared to date, and that’s really saying something. I love your step-by-step recipes and how frequently you’ve been doling them out lately. Keep them coming, please! I adore zucchini, and pizza, so this sounds and looks perfect to me! Love how you said if you ask a chef how long it takes to cook something they will say cook it till its done. I say that all the time – I thought it was a bad habit, but I never really pay attention to how long it takes I just keep an eye on it. I normally just guess at the temp. of the oven as well; I just set it to what I think would be right. That pizza looks really good, I will have to make it next time I get a pizza craving! That pizza looks incredibly face-rockin’. And so easy too! 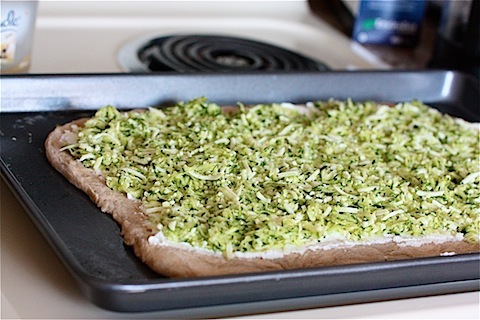 I loved zucchini blossom pizza when I was in Italy – this would be a great way to recreate it. seeing the candle in the background reminds me of how I am constantly trying to find a new candle that will really help me get rid of the smell of garlic and spices after I cook. I have a tiny apartment and sometimes my bath towels smell like garlic! It’s ok now because I can open windows, but in the winter I have to burn a candle constantly. 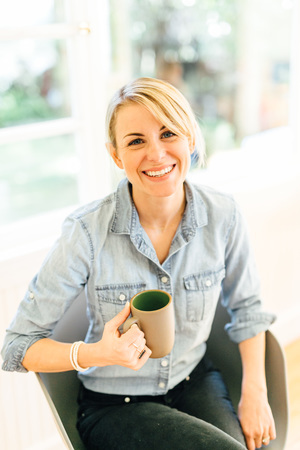 Do you think of yourself as a Chef first or a Writer?!…. This looks great! I now know what I’m doing with the zucchini sitting in my fridge. This is genius! We just got a boatload of zucchini in our CSA and I was running out of ways to use this. And on top of this, husband already asked if we could have homemade pizza tonight. Holy yum! And simple – just the way I like it. I’m into this! I’ll have to wait to make it until my hubby’s out of town though, since he refuses to eat pizza without red sauce. He’s so limited, geez! Anyway, love cooking when I’m alone sometimes… great activity, esp. when wine is involved. Looks amaaaazing! Can’t wait to try it out! This will be a perfect use-up for all my zucchini! I’ve already overdosed on zucchini muffins and bread. Yum! Also, how do you get your TJ’s pizza dough to s-t-r-e-t-c-h? I just use my hands but I LOVE a thicker crust and hate how there crust is more like flat bread. AND I always pre-bake for 5 mins @ 450 to avoid the sogginess. Any suggestions? 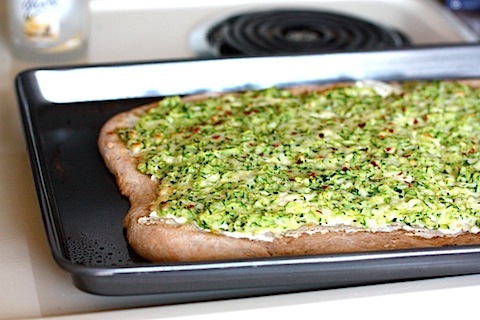 Mmm…totally love zucchini on pizza. Especially with the ricotta. It’s like a combination of lasagna and pizza, all in one delicious bite. I’ll bet it would be good with a few diced tomatoes too. amazing recipe! and a frugal wheat dough- love it!! Mmmm. the pizza looks great, I am definately going to be making this real soon. 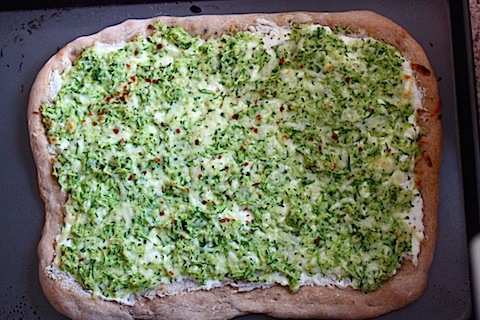 sign me up for this…cheesy zucchini goodness? YES PLEASE! Omg I LOVE zucchini on pizza! Cannot wait to try this recipe! Bookmarked! 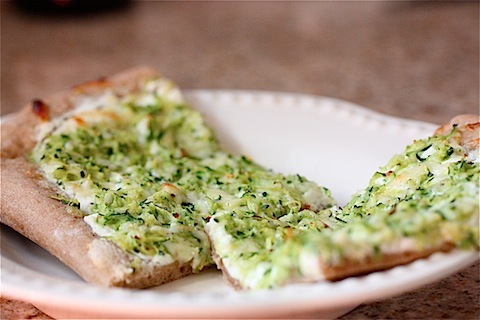 Zucchini and ricotta together is a dreamy pair, and I love the suggestion to grate the zucchini to add textural interest. By the way, I’m only a *tiny* bit jealous of your lovely August in California. It’s the indoor season where I live now! I was so inspired by this post that I made it tonight! Unfortunately the store near me does not sell pizza dough so I used your pizza dough recipe. My fiance and I loved it. Thanks so much for the idea, the leftovers are going to be appetizers for my dinner party tomorrow :). I made this pizza for dinner tonight – ABSOLUTELY delicious! My husband already told me this is a recipe that I have to make again. Keep the great recipes coming! This is in my oven right now and i’m beyond excited!!!! I just made this tonight (added some sliced tomatoes and sunflower sprouts on top) and it was AMAZING. Thank you! Yummmmmmy! I have a similar recipe I make that is also amazing. Add pancetta and a little lemon zest to the recipe you have here and then some fresh basil right after it comes out of the oven. And if you really want to make it sing, a little truffle oil drizzled on top, so delicious!! 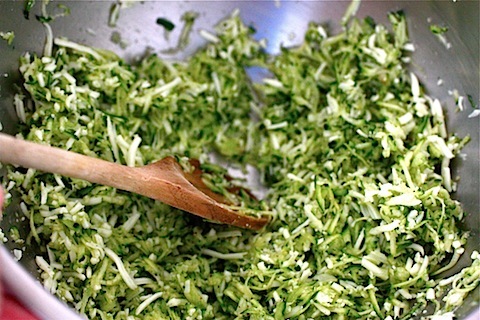 I LOVE grated zucchini. 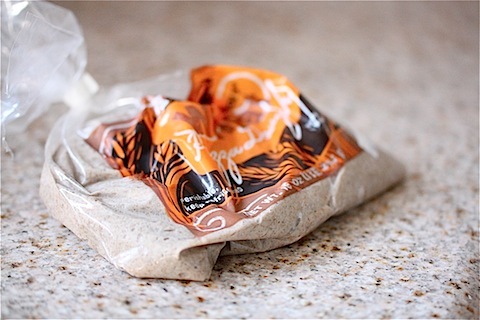 Sometimes, I even grate it into my oatmeal (with cinnamon, nutmeg, and walnuts!) for a zucchini-bread for breakfast kind of day. And it helps you get in an extra serving of veg! I’m so making this for dinner tonight. The salad bar at my local grocery store has shredded (matchstick) zucchini and I LOVE LOVE LOVE it on a salad. I love cucumbers but they’re a pain in a salad unless you dice them up (I’m a fan of chopped salads, personally) so the matchstick zucchini are a great alternative. Try it! Just bought all the ingredients! Making this tonight! Thanks Jenna! SO delish, i have been thinking about your pizza since last week and i DREAMED about it last night! finally made it tonight and it rocked our faces off! 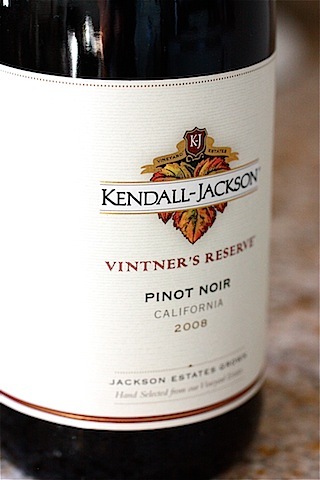 had to make a run to the kroger for a splash of zin before we ate and it was the perfect dinner, even if we didn’t eat til 830 :o) thanks jenna! My best friend and I both broke up with our significant others last week. Tonight, we made this recipe, had a glass of wine, and talked and talked. It was glorious! Thank you – great, great recipe! Not sure if you’ll read this (late comment! ), but I was wondering . . . could you sub in some goat cheese in there? Maybe 1/2 and 1/2? that would be yummy!! Try it! … fast forward a few minutes & this easily became one of his favorites. and of course, mine too. thank you ELR! I made this last night and blogged about it today. Amazing. Thanks for sharing! I made this tonight and it was amazing! I even used a personal size Boboli and low fat ricotta and it was delicious. Thanks for the great recipe! Hi! I linked to this post from my blog post on pizza. Just wanted to let you know! I made this for dinner tonight and it is by far my new favorite pizza! Deeeeeeelicious! Thanks so much for sharing! Just made this pizza last night and it was INCREDIBLE. 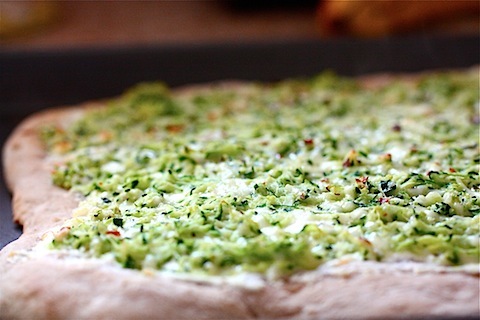 the grated zucchini is a genius idea for a pizza topping. I have died and gone to heaven. Seriously. I have made your pizza crust but for convenience tonight I used the basic “light whole wheat” bread from “Artisan Bread in 5 min a day” recipe, which I lopped off the stash in my fridge. O. M. G. I don’t use that term very often, but if there was ever a food I wanted to roll around in while sipping red wine, this would be it. I made this pizza tonight, and both my husband and I absolutely loved it! Definitely going into the “pizza night” rotation :). I just made this tonight and added tomato slices and prosciutto and it was amazing, thank you for the recipe! I just made this last night and it was awesome! Used yellow squash which was even better because my little ones did not know there was squash on the pizza. Eating the leftovers now. YUM! This was yum – although I changed it around a lot. Instead of zucchini I used broccoli, and blended up some of it with the ricotta and added lemon zest too, then spread it on the base and topped it with whole broccoli florets and cheese. Was so yum! Thank you for an easy and truly delicious recipe!!!! Many thanks for creating this ‘za. I was looking for ‘za-thing to do with zucchini I had and Google brought me here. SNAP – there’s a treasure-trove of goodies here. Very serious High-5s being thrown your way. Just made this tonight and it came out perfectly, thanks!! My kids are eating this right now! We picked fresh fiddlehead ferns and put them on top! Looks awesome, going to pull some dough out of the freezer and make some tonight. We make our own dough and freeze it for just such an occasion. My wife and daughter enjoy making pizzas too and we grill them year round here in beautiful northern Michigan. I love pizza especially cheese pizza.